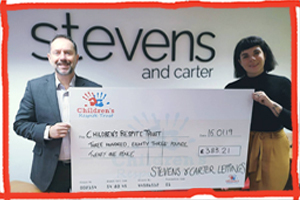 The wonderful Stevens and Carter from Hailsham have helped the Children’s Respite Trust by donating an incredible £383.21! Keely went down to meet with the wonderful chaps that are Stevens and Carter and was presented with a cheque for us. We will be using this towards providing our respite services across Sussex and Kent. We could not be happier! Amounts like this really do help the Trust with the work we do, and can pay for a whole days care in the centre, or even fund a Support Worker out and about in the community providing care for families needing a few hours respite a week. From everyone here at the Trust, thank you Stevens and Carter!